Текущий всегда будет без расширения и с именем ERRORLOG, далее по возрастанию от 1 и выше, 1 это предпоследний. Чтобы держать файлы в порядке и читабельными, желательно указанную команду прописать в sql задание на раз в месяц. 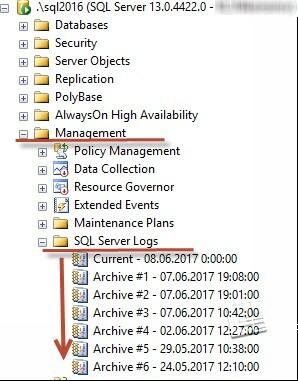 Итак, что говорит нам SQL Server Log? Сразу можно определить версию SQL Server, установленные обновления и ОС, время старта SQL Server. Довольно часто, обновления не ставят на сервер, но имеют проблемы. Как-то обратился клиент, у него имелось куча проблем, попросил данный журнал SQL server, а у них версия SQL server 2008R2 RTM, при том что за окном уже SQL версии 2017 на подходе. Первое рекомендация и необходимость дальнейшей работы – установить обновления последния. 2017-06-18 12:26:50.32 Server (c) Microsoft Corporation. 2017-06-18 12:26:50.32 Server All rights reserved. 2017-06-18 12:26:50.32 Server Server process ID is 8112. 2017-06-18 12:26:50.32 Server System Manufacturer: 'FUJITSU', System Model: 'PRIMERGY RX4770 M3'. Вендор и модель сервера, тоже важно. При виртуализации это здесь так же видно. 2017-06-18 12:26:50.32 Server Authentication mode is MIXED. Вид аутефикации на сервере - здесь смешанная. 2017-06-18 12:26:50.32 Server Logging SQL Server messages in file 'C:\SQL\MSSQL13.MSSQLSERVER\MSSQL\Log\ERRORLOG'. Каталог расположения этого самого журнала. 2017-06-18 12:26:50.32 Server The service account is 'AD\SQL_USER'. This is an informational message; no user action is required. Учетная запись, под которой работает служба SQL Server. Сразу и легко определяес под кем работает служба, далее можно у админов ОС запросить проверку прав в ОС или что-то подобное. Параметры старта SQL server, здесь видим флаги запуска службы SQL server, располжения системных баз данных. 2017-06-18 12:26:52.86 Server SQL Server detected 4 sockets with 24 cores per socket and 48 logical processors per socket, 192 total logical processors; using 192 logical processors based on SQL Server licensing. This is an informational message; no user action is required. 2017-06-18 12:26:52.86 Server SQL Server is starting at normal priority base (=7). This is an informational message only. No user action is required. Видим, сколько процессоров на сервере и включен ли HT. 2017-06-18 12:26:52.86 Server Detected 3193980 MB of RAM. This is an informational message; no user action is required. Память на сервере, здесь 3 Тб. 2017-06-18 12:26:52.86 Server Using locked pages in the memory manager. Видим, что учетной записи SQL server предоставлены права блокировать память на сервере, а также выделение больших страниц в памяти. 2017-06-18 12:26:57.71 Server Machine supports memory error recovery. 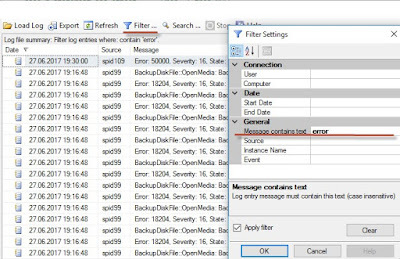 SQL memory protection is enabled to recover from memory corruption. 2017-06-18 12:27:00.82 Server Automatic soft-NUMA was enabled because SQL Server has detected hardware NUMA nodes with greater than 8 physical cores. Включается soft-Numa в SQL 2016. 2017-06-18 12:27:00.90 Server Buffer pool extension is already disabled. No action is necessary. 2017-06-18 12:27:01.04 Server InitializeExternalUserGroupSid failed. Implied authentication will be disabled. 2017-06-18 12:27:01.04 Server Implied authentication manager initialization failed. Implied authentication will be disabled. 2017-06-18 12:27:01.13 Server This instance of SQL Server last reported using a process ID of 8116 at 6/18/2017 1:06:37 PM (local) 6/18/2017 10:06:37 AM (UTC). This is an informational message only; no user action is required. 2017-06-18 12:27:01.13 Server Node configuration: node 0: CPU mask: 0x0000000000555555:0 Active CPU mask: 0x0000000000555555:0. This message provides a description of the NUMA configuration for this computer. This is an informational message only. No user action is required. 2017-06-18 12:27:01.14 Server Node configuration: node 15: CPU mask: 0x0000aaaaaa000000:3 Active CPU mask: 0x0000aaaaaa000000:3. This message provides a description of the NUMA configuration for this computer. This is an informational message only. No user action is required. 2017-06-18 12:27:01.31 Server Using dynamic lock allocation. Initial allocation of 2500 Lock blocks and 5000 Lock Owner blocks per node. This is an informational message only. No user action is required. 2017-06-18 12:27:01.31 Server Lock partitioning is enabled. This is an informational message only. No user action is required. 2017-06-18 12:27:01.34 Server Database Instant File Initialization: enabled. For security and performance considerations see the topic 'Database Instant File Initialization' in SQL Server Books Online. This is an informational message only. No user action is required. 2017-06-18 12:27:01.41 Server CLR version v4.0.30319 loaded. 2017-06-18 12:27:01.53 spid10s Starting up database 'master'. 2017-06-18 12:27:01.53 Server In-Memory OLTP initialized on highend machine. 2017-06-18 12:27:01.59 Server Common language runtime (CLR) functionality initialized using CLR version v4.0.30319 from C:\Windows\Microsoft.NET\Framework64\v4.0.30319\. 2017-06-18 12:27:01.72 spid10s CHECKDB for database 'master' finished without errors on 2017-06-21 03:35:10.293 (local time). This is an informational message only; no user action is required. 2017-06-18 12:27:01.72 spid10s Resource governor reconfiguration succeeded. 2017-06-18 12:27:01.72 spid10s SQL Server Audit is starting the audits. This is an informational message. No user action is required. 2017-06-18 12:27:01.74 spid10s SQL Server Audit has started the audits. This is an informational message. No user action is required. 2017-06-18 12:27:01.78 spid10s Server name is 'server1'. This is an informational message only. No user action is required. 2017-06-18 12:27:01.80 spid10s Database mirroring has been enabled on this instance of SQL Server. 2017-06-18 12:27:01.80 spid20s Always On: The availability replica manager is starting. This is an informational message only. No user action is required. 2017-06-18 12:27:01.81 spid20s Always On Availability Groups: Waiting for local Windows Server Failover Clustering service to start. This is an informational message only. No user action is required. 2017-06-18 12:27:01.81 spid20s Always On Availability Groups: Local Windows Server Failover Clustering service started. This is an informational message only. No user action is required. Сервер является частью кластера, включен компонент AlwaysOn. 2017-06-18 12:27:01.81 spid12s Starting up database 'mssqlsystemresource'. 2017-06-18 12:27:01.81 spid20s Always On Availability Groups: Waiting for local Windows Server Failover Clustering node to start. This is an informational message only. No user action is required. 2017-06-18 12:27:01.81 spid20s Always On Availability Groups: Local Windows Server Failover Clustering node started. This is an informational message only. No user action is required. 2017-06-18 12:27:01.81 spid20s Always On Availability Groups: Waiting for local Windows Server Failover Clustering node to come online. This is an informational message only. No user action is required. 2017-06-18 12:27:01.81 spid31s Starting up database 'DB'. 2017-06-18 12:27:01.81 spid22s Starting up database 'DB2'. 2017-06-18 12:27:01.81 spid25s Starting up database 'DB3'. 2017-06-18 12:27:01.81 spid26s Starting up database 'DB4'. 2017-06-18 12:27:01.82 spid24s Starting up database 'msdb'. Получаем список баз данных на сервере и далее можно отследить как они инициализируются, без проблем или нет. 2017-06-18 12:27:01.82 spid16s Server is listening on [ 'any' <ipv6> 1433]. 2017-06-18 12:27:01.82 spid16s Server is listening on [ 'any' <ipv4> 1433]. 2017-06-18 12:27:01.82 spid16s Server local connection provider is ready to accept connection on [ \\.\pipe\SQLLocal\MSSQLSERVER ]. 2017-06-18 12:27:01.82 spid16s Server local connection provider is ready to accept connection on [ \\.\pipe\sql\query ]. 2017-06-18 12:27:01.82 Server Server is listening on [ 'any' <ipv6> 1434]. 2017-06-18 12:27:01.82 Server Server is listening on [ 'any' <ipv4> 1434]. 2017-06-18 12:27:01.82 Server Dedicated admin connection support was established for listening remotely on port 1434. 2017-06-18 12:27:01.83 spid12s The resource database build version is 13.00.4435. This is an informational message only. No user action is required. 2017-06-18 12:27:01.83 spid16s SQL Server is now ready for client connections. This is an informational message; no user action is required. 2017-06-18 12:27:01.83 Server SQL Server is attempting to register a Service Principal Name (SPN) for the SQL Server service. Kerberos authentication will not be possible until a SPN is registered for the SQL Server service. This is an informational message. No user action is required. Проблемы с SPN, возможные, возможно SPN уже есть, просто нет прав на просмотр SPN. 2017-06-18 12:27:01.84 spid26s [INFO] HkHostDbCtxt::Initialize(): Database ID:  'DB3'. XTP Engine version is 2.9. 2017-06-18 12:27:01.87 spid12s Starting up database 'model'. 2017-06-18 12:27:01.89 Server The SQL Server Network Interface library could not register the Service Principal Name (SPN) [ MSSQLSvc/server1.ad.ru ] for the SQL Server service. Windows return code: 0x2098, state: 15. Failure to register a SPN might cause integrated authentication to use NTLM instead of Kerberos. This is an informational message. Further action is only required if Kerberos authentication is required by authentication policies and if the SPN has not been manually registered. 2017-06-18 12:27:01.89 Server The SQL Server Network Interface library could not register the Service Principal Name (SPN) [ MSSQLSvc/server1.ad.ru:1433 ] for the SQL Server service. Windows return code: 0x2098, state: 15. Failure to register a SPN might cause integrated authentication to use NTLM instead of Kerberos. This is an informational message. Further action is only required if Kerberos authentication is required by authentication policies and if the SPN has not been manually registered. 2017-06-18 12:27:01.94 spid12s CHECKDB for database 'model' finished without errors on 2017-06-21 03:38:53.560 (local time). This is an informational message only; no user action is required. 2017-06-18 12:27:01.94 spid12s Polybase feature disabled. 2017-06-18 12:27:01.94 spid12s Clearing tempdb database. 2017-06-18 12:27:02.06 spid12s Starting up database 'tempdb'. - стартовали системные бд, дальше идут уже сообщения относящиеся к базам данных, работе сервера или ошибки. 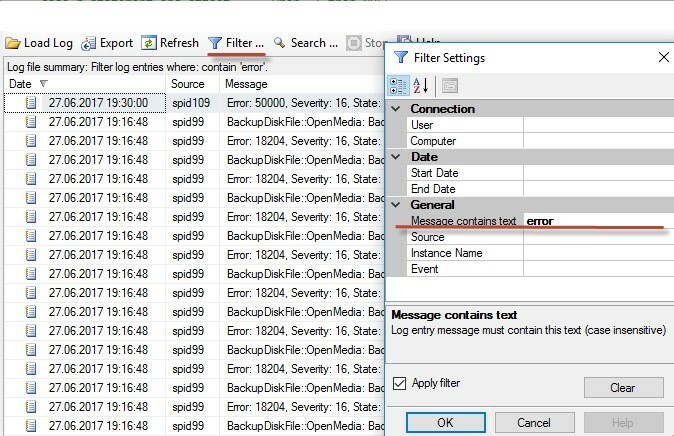 Итак, мы прошлись по журналу ERRORLOG SQL Server, как видим, он содержит много полезной информации и может служит начальной точкой при начале диагностике проблем в MS SQL Server. Если вас просят провести диагностику сервера или решить проблемы, а с другой стороны специалист мало знаком с SQL Server, просто попросите его найти на сервере файл ERRORLOG, заархивировать его и прислать вам, в итоге вы без лишних разговоров получите много информации об сервере.